Good morning all! I'm looking forward to a great Thursday:) We'e going to get up to 60 today, the flowers are blooming, and I'm relieved that Winter is finally retreating! Feels good! Here's a little card to say "Hello" to Spring! I pulled out some of my favorite Avery Elle sets for this one (Petals and Stems, Rounded Diamonds, and Laurels)! In my mind, you can never go wrong with a bold graphic, bright flower, and a touch of gold. I stamped and die cut my flower (added a bit of shading with my Copics). Then I stamped the bold graphic background, slightly offset. Then the sentiment. And lastly a good sprinkling of hexagon glitter (from Michael's, if you're wondering). For the glitter, I used a glue pen and just randomly dotted around and sprinkled the glitter over. Whatever stuck, stuck! You know I love this one. So bold and graphic! 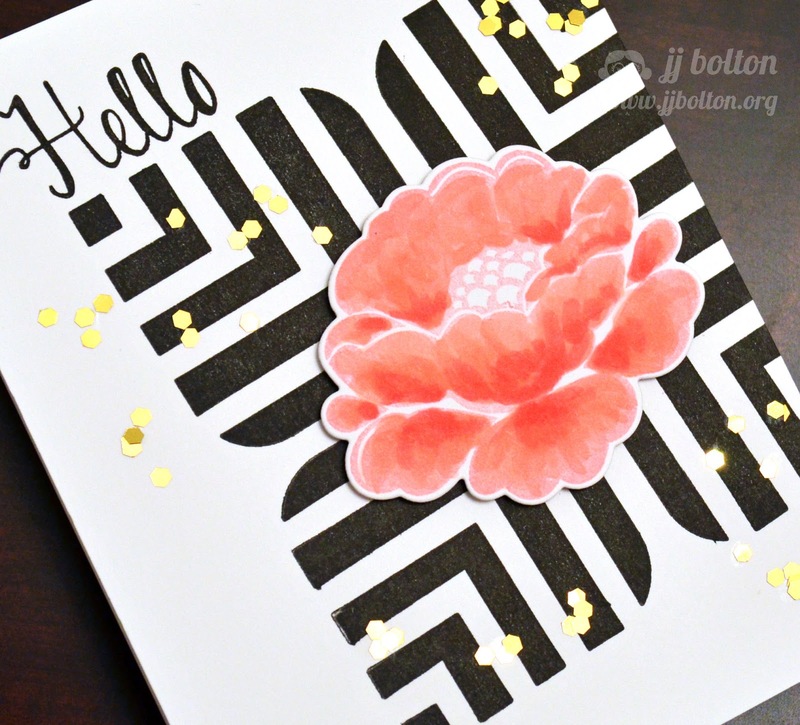 Love that the black and white element goes off the page and I love the inclusion of the gold glitter/sequin pieces! This is totally gorgeous! 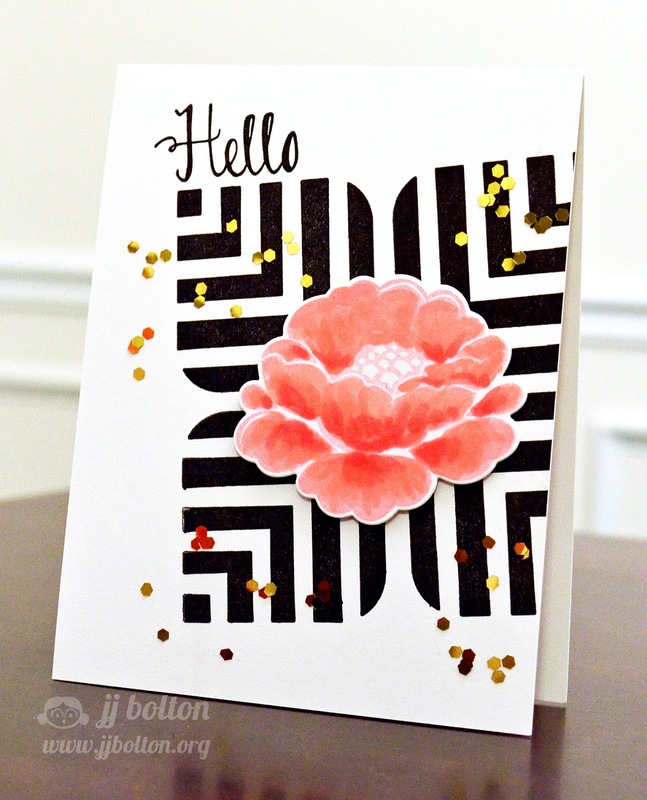 Love the hexagon gold sprinkle. Love your no-stress method of adhering glitter!! The soft pink and the bold b&w contrast ... so very exciting!!! This is card is so compelling, JJ! I am a sucker for bold black and white + color and the glitter is a gorgeous addition! I really love how you paired the rounded diamonds with this gorgeous flower, JJ! 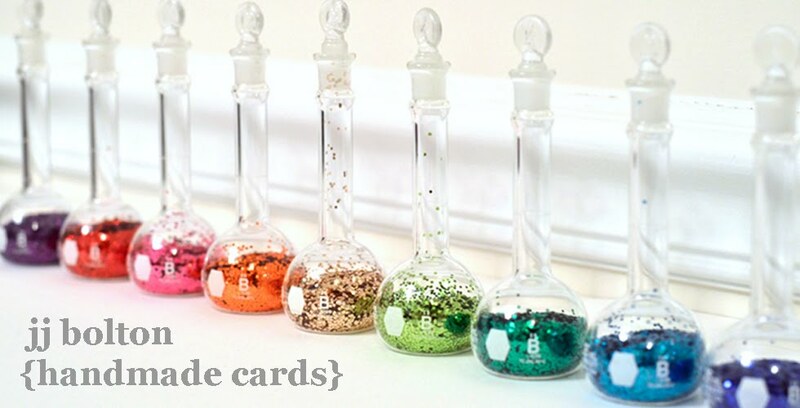 It's so pretty...and your hexagon glitter is very cool! The black and white background really pops! Love your card! Absolutely stunning card. Saw it and started to drool. What a stunner, JJ! From the delicate coloring to the sprinkle og hexagon glitters and the bold rounded diamonds as a background, there's nothing I don't adore about this card! This is just beautiful!! LOVE every single detail!